Premier League Scores: Everton V Liverpool Highlights. Premier League Scores: Result and Highlights from the EPL Fixture between Everton V Liverpool On Sunday, October 28, 2012. 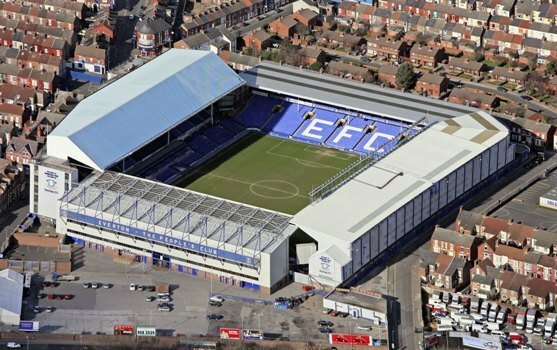 The Merseyside derby is one of the biggest in the world. Perhaps if the two clubs were vying for trophies it would be as massive as Barca v Real Madrid. Today’s match was nothing short of spectacular. Luis Suarez took credit for Liverpool’s first goal in the 14th minute when his shot/cross went in off of Leighton Baines’ front leg. He followed up with a goal celebration including a theatrical flop in front of David Moyes. Liverpool’s second goal came with an excellent header from Luis Suarez into the far corner out of Tim Howard’s reach in the 20th minute. Two minutes later Everton answered back as Brad Jones attempted to punch the ball clear but only got the ball as far as Leon Osman at the top of the box. Everton’s second goal came in the 35th minute when Stephen Naismith latched onto a Marouane Fellaini cross. Naismith did a great job of moving and creating space for himself to get between the Liverpool defenders. The first half was full of excitement with most statistics fairly even. Everton enjoyed most of the possession and had more shots (8 with 3 on goal compared to 4 and 1 on goal for Liverpool) and they did a great job of working their way back into the game after going down 2 within the first 20 minutes. The second half saw Everton dominate and looked the better side. They did well creating chances and keeping the ball in Liverpool’s half, but weren’t able to get the goal they needed. I was surprised by both sides’ play. I thought that Liverpool would maintain more possession throughout the match with Everton doing more counterattacking. Instead Everton did very well controlling the ball and keeping it with Liverpool looking to counter. In the last 10 minutes Liverpool started to push up more and looked very dangerous. They had several close chances with both Suarez and Steven Gerrard coming close, but the Everton defense held strong. Luis Suarez had a goal disallowed in stoppage time. Replays showed that he was clearly on side and Liverpool should have gotten the win from it. Yet another controversial call from a linesman to deny a win will lead to more calls for video technology to be used. In this situation it would take mere seconds to get the call right. Unfortunate for Liverpool and poor from the referee. Liverpool should be happy with the draw considering the way the match went while Everton deserved the win and will be wishing they had done more to get it.